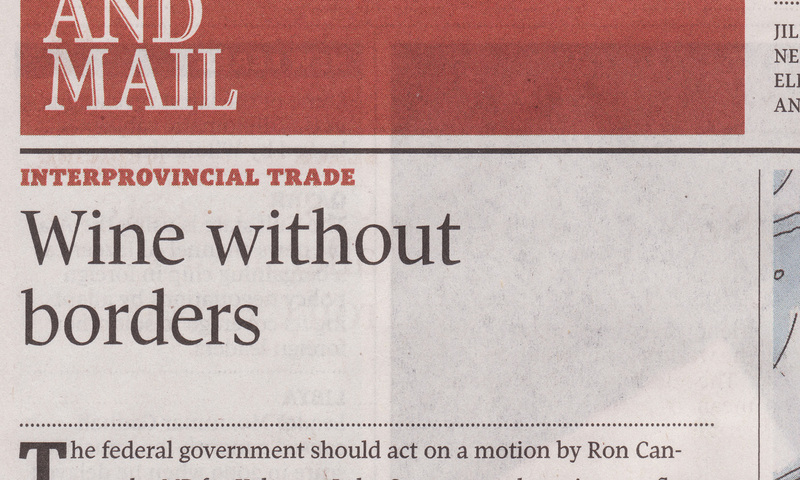 The lead editorial in the Toronto Globe and Mail on Monday December 6, 2010 endorsed a private member’s motion in Canada’s Parliament. The subject motion, brought by MP Ron Cannan, seeks to amend the Importation of Intoxicating Liquors Act (IILA) to provide an exemption allowing individuals to import wine from one province to another without delivery of the imported wine to the local provincial liquor board. Mr. Cannan is the MP for Kelowna-Lake Country, the riding which encompasses the city of Kelowna, BC and surrounding lands to the east of Lake Okanagan. This region encompasses part of BC wine country and thus is an important contributor to the BC economy. The IILA was enacted as a Federal statute in 1928 when Prohibition was repealed in Canada – clearly a different time and different mindspace related to alcohol when compared to today. Under the provisions of the IILA it is prohibited for an individual to transfer wine across provincial borders without doing so through the auspices of the provincial liquor board of the importing province. This assures the local provincial liquor authorities will retain full control over all beverage alcohol consumed in the province and they will collect all relevant taxes and markups on that beverage alcohol. There have been instances where wineries in one province have sold wines to residents of other provinces through on-line ordering facilities. These wineries have been sanctioned by certain provincial liquor boards for not restricting such out-of-province sales. The issue of direct shipment of alcohol across state borders in the United States has restricted trade for many years: since the 1993 repeal of the 18th Amendment to the US Constitution, at which time the 21st Amendment granted authority to the States to control/restrict cross-border transportation of alcohol. A US Supreme court decision in 2005 (Granholm v. Heald) overturned the states ability to discriminate between in-state and out-of-state wineries and since that time 37 states have established laws to allow direct shipment from a winery in one state to the home state of the purchaser. Welcome to the 21st century! I hope the motion by Mr. Cannan sees the light of day in Parliament sometime soon. Presently it is prohibitively expensive to import wine into Ontario from BC (and vice-versa) and even when the LCBO does list a BC wine it chooses to add HST and its own markups to the ex-winery BC price so we end up with wines that are outrageously priced. I grant that it will cost the consumer to ship wine from BC to Ontario and that is a cost that the consumer will have to assess when making the decision to directly purchase from the winery. In any case that shipping cost will not likely approach the $15.00 per bottle price differential between the winery price and the LCBO price for Laughing Stock Portfolio. Speak to your local MP and make sure he/she is aware of your support for this overdue proposed amendment to an out-of-date and unnecessary restriction of trade. Mention the fact that some prominent legal experts have argued that the IILA is a contravention of the Constitution Act of 1867 (section 121) that provides for open access to the goods of one province to all the others. MPs in the wine regions of Ontario and BC should rally behind their colleague from Kelowna-Lake Country in support of this motion. In the meantime, the petty thinking of our provincial liquor bureaucrats continues to frustrate wine lovers and wine makers in BC and Ontario and residents in the rest of our provinces. W John Switzer can i subscribe ur news letter? You’re on the distribution list. next issue will be late next week.